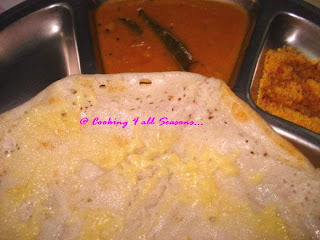 Cooking 4 all Seasons: Cheese Dosa & Corn flour Dosa ~ 101 Dosa Varieties! 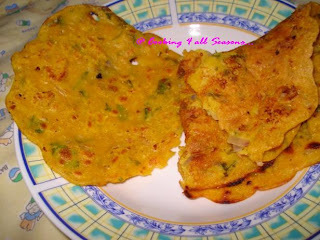 I have confessed my addiction to Dosas in my dear blog, many a sunny posts. But I guess, I have never really tried to proclaim the love I have for Pizzas. Its just like those yummy dishes which you just visualize, with a wink of an eye and the whole panorama becomes real in your eyeball. When I think of Pizza, all I need to do is same. And I get all worked up. I never indulged in that exercise, for the simple reason that I will not really be able to get that in real. The many days spent in kneading and punching down a pizza base and lovely spreading the thick succulent spicy sauce and then topping with loads of cheesy cheese and digging my teeth in it, my, just thinking about it, makes me long for a bite now. I have, each and everytime, burnt myself when I, in a haste to taste it, dig into a hot pizza straight out of my oven. Now that I have only my microwave, don't indulge in this exercise much. That and the fact that it is little time consuming, has deprived me of a homemade pizza. Before I let everybody assume that I am going to post on a pizza, let me come clean and profess my other love, the royal dosa. This time topped with Cheese! One late evening, for want of a better replace, I thought cheese on dosa will be awesome. Yes, it had indeed kept up to my imagination. When this thought struck me, I just couldn't wait to try this combination. I served this with coconut chutney but I guess with just tomato sauce it would've been great. There is no recipe as such, but simple as it is, its just so tasty! I love Corn kernel as boiled. But we don't use the flour much. For me, most other alternative way to eat corn is the popcorn. But recently, Athamma had got a bag of corn kernels from my sil place. They were quite mature and thick kernels. The bag had been lying around for quite sometime, finally had time to send it to the mill to make a flour out of it. And since then, I didn't know what to do with it. I thought I will try Corn Halwa, then thought better of it and decided for a Corn flour paratha. Finally, time permitted us to prepare only Corn Flour Dosa. Since this was the first time we were attempting, we mixed little rice flour to get it going. Came out really so awesome. So if we are not able to finish off the flour on hand as other dishes, this is what it is going to be ending as. You won't believe but I tasted this with rasam and it tasted just too good.